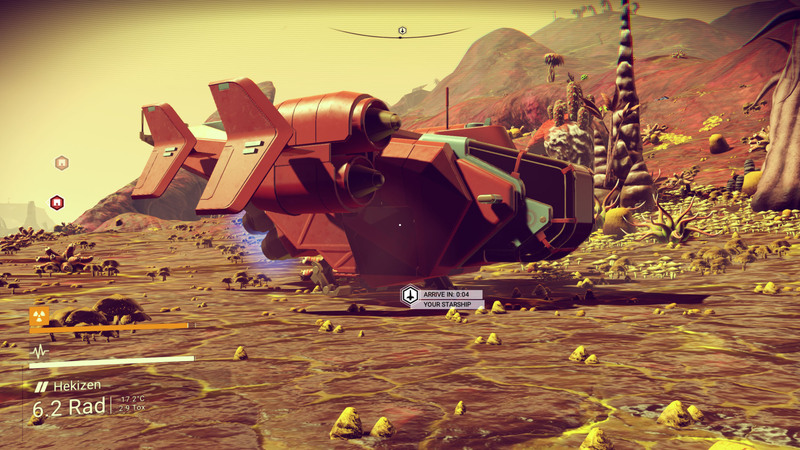 As of this writing, No Man's Sky was just released for the PC last week, less than seven days ago. 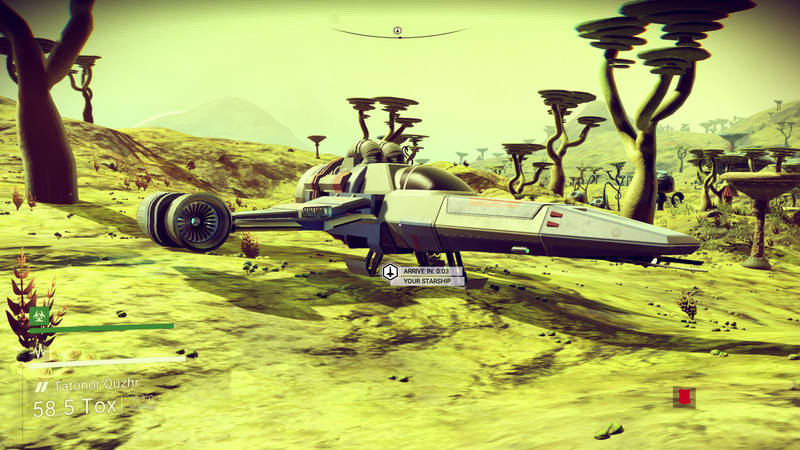 There have been many reports of crashes, framerate and compatibility problems, and so on. This article isn't so much a review, as it is an overview and "first thoughts" from someone who is playing the game as a real player, not as a reviewer, and can describe my experiences and offer some quick starting tips as well. I'm far enough into the game as of this writing, to offer a good description, but haven't seen the ending yet. That's OK, I'm going to keep this spoiler-free and only talk about general gameplay, and dispel some of the confusion that you start with. To be clear, the developers intended for you to be thrown into the game with no idea what to do. But for most people that's frustrating, and there are only a few details that need explaining for you to be able to hit the ground running and enjoy yourself. Note: This is not a comprehensive walk-through, review, or complete guide to the game. Rather, this is intended to give you an idea as to whether the game might be something you would enjoy, and then give you a few pieces of information to allow you to get started a little more easily. 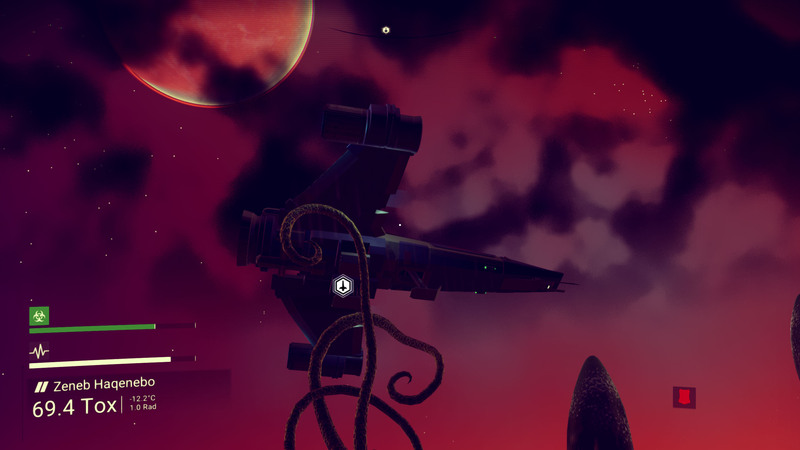 Now, where did I leave my ship? It is a space exploration, gathering, survival, and discovery game. Think of it as a sort of cross between sandbox survival games like Minecraft, and space commerce games like Elite Dangerous. It's heavy on the survival and gathering aspects, and light on the combat (or at least, the combat is simplistic and awkward, but always available). Because of this, if you don't enjoy the game for the exploration, and the gathering and upgrading experience, then you won't enjoy this game for long. You will get bored. However, if you like upgrading your ship, and constantly visiting new environments, and flying to worlds where you can step out of your ship and walk around, you may get a kick out of what this game's technological design can offer. According to the developers, it has quintillions of procedurally generated planets, right down to the landscape, environment, plants, animals, resources, and ships. Even the background music is procedurally assembled. The universe is vast, to say the least, and you can't ever hope to fully explore even the surface of a single planet, let alone the quintillions of them. The player is expected to get what they want and/or need from any given place, and move on. The "end game" is finding your way to the center of the universe, or galaxy (I've heard it worded both ways). As of version 1.03, the player starts approximately 175,000 light years away from the center, and the standard hyperdrive's jump range is a maximum of 100 lightyears (not including upgrades, or taking 2,000ly shortcuts through black holes). You can do the math on how long that will take to traverse. The "story" is mostly a path of discovery. As you explore, you'll interact with the three intelligent alien races, the Vy'keen (warriors), the Korvax (scientists), and the Gek (traders). They all have their own opinions on the matter, but the mysteries of the galaxy revolve around the nature of reality, intelligence, and the path of the travelers (players), and how Atlas (the red orbs) fits into all of that. As you travel, you will see many different worlds and environments, different styles of ships and space stations, and building architecture. And yet, it's all the same too, everywhere you go. Every space station has the same internal layout. You interact with the same three species of intelligent aliens. You find the same kinds of abandoned bases, drop pods, ruins, and so on. And you do the same things in all of these places. This is where some of the controversy of the game comes from, and why some players are unhappy with the game, while others are thoroughly enjoying it. You will slowly unfold the history and context of this universe, but the gameplay will always be: explore, gather, build, upgrade, travel, repeat. You may enjoy that, or you may not. But to the developer's credit, the apparent homogeneity is also part of the loose "story". Every place you visit is different, and yet strikingly similar. Most of the time, it will be a place that no other human has seen, and yet it's populated by the same aliens. The dichotomy of this is engaging and yet maddening. How will you react to this? The game has a decidedly cartoonish style to it, despite going for a certain amount of visual realism in planetary environments. The style is colorful and internally consistent, and works well to both explore something new, while also being reminiscent of space exploration games that we've seen over the last thirty years. The alien races, and how you communicate with them, are exactly from what you would expect from the genre, and remind me of a whole litany of games that preceded this, such as Starflight, Lightspeed, Star Control 2, and so on. While some people might prefer a more photorealistic and desolate look to space, we have to remember that the pastel colors and cartoonish ships are completely intentional. It's meant to feel like you have stepped into the cover of a classic sci-fi novel, and it achieves this very well. Most environments you visit will be lush and populated, but not all worlds are like that. The procedural universe isn't completely a new concept. Starflight (1986) had a procedural system with surface maps for its planets. While it only had around 850 planets overall, it also fit inside a pair of 360k floppy disks, and was one of the first games to allow free-form exploration between the stars, and random encounters with multiple alien species. 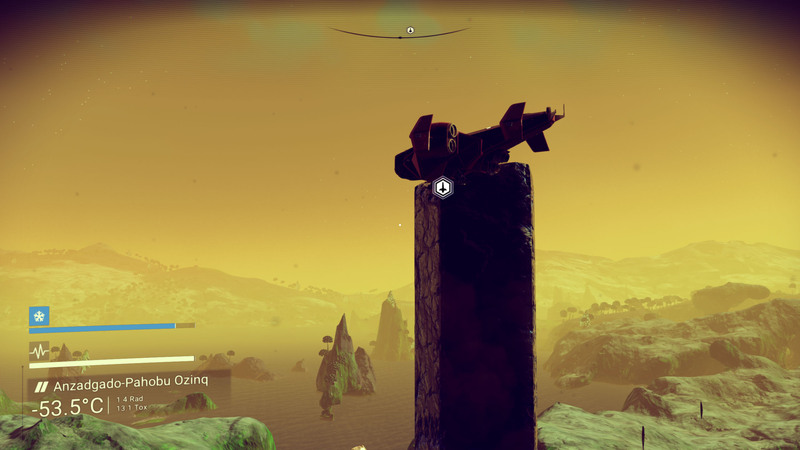 In many ways, No Man's Sky reminds me of this, with the ability to land on planets, explore their surfaces, and catalog the lifeforms encountered, while gathering resources, and discovering some ancient secrets about your corner of the universe. However, what NMS does to great success, is create absolutely enormous environments. The planets in some cases are actually Earth-sized. They're huge. Everywhere you go, you can be pretty certain you're the only human being ever to have seen that specific location, and it would look the same to another player, if they were to travel there. The procedurally generated worlds are created the same way for every visitor, even though the chances of another visitor crossing through the same path as yours is pretty slim. And every discovery presents an opportunity for you to name that discovery, which will be uploaded to a central server, for all future players to see if they do cross through pre-discovered territory. So while it's a single-player game, it also carries with it the idea of "playing together, separately", or what some have called a "Massively single-player game", a term which was created for Spore. This lends a certain amount of meaning and context for everything you do, that goes beyond what the game actually provides you. I have been playing with an Intel i7 4770k (@4GHz), and NVidia GTX 970, with a dual monitor setup. I also have a solid state disk (SSD). My primary display is a 30" Samsung at 2560x1600 resolution. The game currently expects a 16:9 aspect ratio only, and my monitor is 16:10. If you run the game in any pixel ratio other than 16:9, it will distort a 16:9 field of view into whatever resolution and aspect ratio you're using. Plus, the game will crash if you alt-tab out of it, while it's in full screen mode. So, I run the game at 2560x1440 in a window, which allows it to run in 16:9, and I can alt-tab out. Sure, I can see my Windows 10 desktop above and below the window, but that's a small price to pay. With this configuration. The game loads in moments, and I don't notice any significant stuttering or freezing. People have reported problems with these, but I haven't noticed. The framerate sometimes drops into the 20s or 30s briefly if I'm looking at a complex scene on a planet, but since I changed the setting to allow 60 frame per second, I'm usually seeing numbers close to 60fps. It defaults to 30 in the graphics settings though, so that is something you may want to check right away. I have the graphics detail settings at their maximums, as a point of reference. However there is a known bug in version 1.03 (which is supposedly getting fixed soon) which causes the framerate to drop to about 10 after 2 or 3 hours of play. I've run into it a few times. Apparently a long play session will result in cache corruption eventually. The fix is to get in and out of your ship, to force a restore point to save, and then exit the game, and fire it up again. 10 hours: I knew what I was doing pretty well by now, and worked toward better stuff, and more blueprints. 20 hours: I had most of the technology, bought a nice upgraded ship, and prepared to start traveling further. Started unlocking all exosuit slots. 30 hours: I could have completed the Atlas Path storyline, but put it aside to focus on completing more tech, finished getting exosuit upgraded. 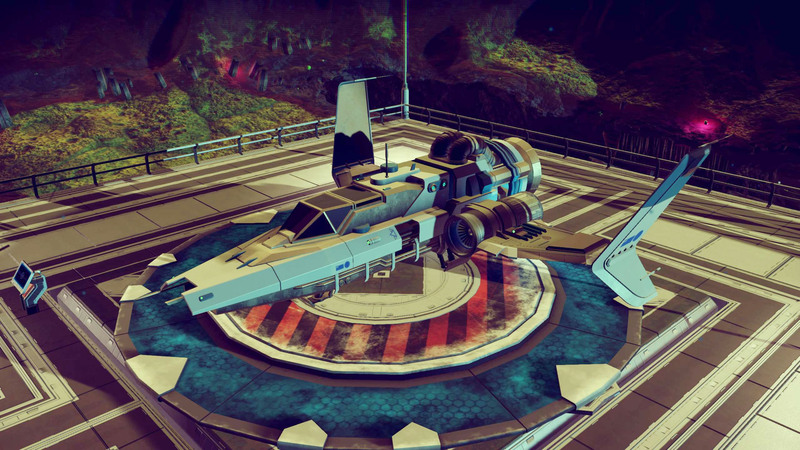 40 hours: Finished Atlas Path, and shifted toward getting a 48-slot ship, and 24-slot multi-tool. Started scavenging ships for upgrades and to sell recycled resources for money. Also some sight-seeing. 50 hours: Max slots on everything, worked on getting prettier ships and more language unlocked. Searched for AtlasPass v2/v3, unsuccessfully. Unlocked more "alloy" blueprints, but still missing one or two. Also general relaxed "let's see what else we can find" exploring. Still only casually travelled in the direction of the center, having gone probably less than 10,000 lightyears total. 80-100 hours: Recieved AtlasPass v2, continued traveling toward center, and starting grinding out the achievements for extreme conditions survival, and completing planet surveys. In this vast universe, having travelled past the 100,000 ly boundary (about 80,000 ly progress inward), I still have yet to encounter anything discovered previously by another player. 110 hours: Received the AtlasPass v3 from a "friend", and then made a hard push for the remaining 100,000 lightyears to the center, and arrived. I could have easily gone to the center at around the 30 to 50 hour mark if I really wanted to. It's not hard after getting good inventory capacity for fuel and repair materials (for all that black hole damage). Went through the center, but restored my save afterward so I can stick around the center region for a while. Again? We're going to get in trouble! Upon starting the game for the first time, you'll be presented with a white screen with the word "initialise" in the center, with an "e" in a circle. It's not a loading screen. The game is waiting for you to press and hold the "e" key. This is annoyingly confusing and unnecessary, but easy enough to do, of course. In fact, it's a useful lesson because nearly all of the menu options and buttons in the game expect you to press and hold the specific keys or mouse buttons, and not just quickly tap or click them. They have a circular progress bar, that takes about a half second of hold time. The only exceptions I can think of, are buttons for increasing or decreasing a quantity of something, where a single quick click will change it by a single digit, and holding will rapidly cycle the numbers. Otherwise, everything else has to be held, so get used it. 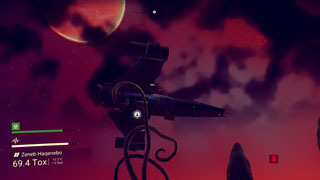 The game will only "save" your progress when you exit your ship, or access a "save" beacon at a facility on the ground, or launch from a space station. 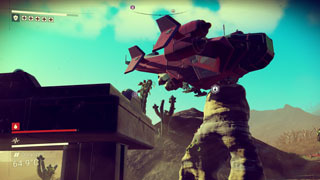 So before messing with graphics settings at the start of the game, which may require the game to restart, you might want to at least get into your crashed starter ship, and hop back out again. Game is saved, so now you don't have to watch the starting sequence again. In fact, any time you need to walk away from the computer, or want to mess with your inventory, just get into the habit of doing those things inside your ship, so that you're not draining your evosuit's life support. Never stray far from your ship. It's better to hop the ship over toward a destination, than to walk there. Launch fuel is easy to come by. Plutonium is everywhere. At this point, you may want to take a look at your surroundings, and see what you have started with. You have a multi-tool, for harvesting resources, and also doubles as a weapon. And you have a crashed ship, which must be repaired before you can leave the planet, and begin your 175,000 lightyear journey to the center of the galaxy. All players spawn at the edge of the universe/galaxy, and this is part of the story. 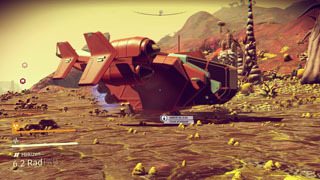 Next to your crashed ship, is a pod that contains a red sphere, which is part of Atlas, the vast presence in this galaxy. Here you will decide if you want to follow the Atlas Path or not. Don't worry, you can change your mind later. However the Atlas Path will give your free warp cells (fuel for the hyperdrive), at least at first, and will guide you toward your goal. The downside is that it may lead you AWAY from the center at times, especially in the beginning. You may also notice some locked containers that require an AtlassPass V1. Ignore those for now. You can't get the AtlasPass V1 until you've warped at least a few times, usually not until you've gone to the first Atlas Interface space station. You may want to start on the Atlas Path for that reason alone. Note: Before doing anything else, if you bought the pre-order of the game and have a starter ship upgrade available, be sure to go into the options and redeem this ship. Warning: if you start with a ship that has a hyperdrive (the pre-order ship does), make sure you DO NOT WARP to another star until you follow the starter quest to the point of receiving the hyperdrive blueprint. You may need it later, if you buy a ship that is not equipped with a hyperdrive. Getting around and doing things. General tips. Controls here are described in terms of keyboard/mouse, for a PC player. If you're playing on console, your controls will of course be different. When using the multi-tool to gather resources, you can run it a little more efficiently if you always stop the beam right before an overheat, and then immediately restart it. You don't need to wait for it to cool off. It will start from zero heat again as soon as the beam re-engages. You ony have to spend a lot of time on foot mining resources early in the game. Later, after upgrading the multi-tool, and doing other things like salvaging ships, you'll find that you can go for long periods of time without grabbing anything other than the occasional plutonium crystal. When you do need to mine something, it goes very quickly with a highly upgraded multi-tool. Plus some of the technology upgrades make your systems more efficient and use up fuels more slowly. Also, Thamuim9 can be harvested quickly from asteroids nearly everywhere in space. Don't feel like you're stuck on any particular hostile world. Unless there's something specific you're collecting, if the place is just too hostile, move on. There are plenty of less hostile planets for you. When walking, you can hit left-shift to toggle your run mode. You only have a small amount of stamina, which will run out. However, you can enhance this stamina with exosuit upgrade components later. Spacebar will thrust with your suit's jetpack. You can get around more quickly, and extend your stamina, but sprinting first (as above), and then using the jetpack. If you want to fly even faster, start sprinting, then use your melee ("q" key), which jumps you forward even faster, and immediately jet after that. You can fly considerably faster than you can walk, this way. And the jetpack's fuel capacity is also upgradable later. The jetpack has nearly unlimited fuel if you're thrusting against a vertical cliff face, to make it easier to get out of holes. Use the targeted scanner on every world ("f" key). Log every new plant and animal you find. Then, using the "p" key, you can go to the discoveries menu, where you can name and upload all of these discoveries, for some quick cash. Use the area scanner ("c" key) all the time. It will show you where important resources are located nearby, as well as knowledge stones, supply drops, technology, etc. If you don't want to get attacked by Sentinels, be careful about destroying things with them nearby. If they start scanning you, just stop using the multi-tool until they're satisfied and move on. If you're actively blowing things up while they're scanning you, they are likely to attack. Occasionally they'll just attack when they're nearby and you harvested something, but it's rare that it will happen with no warning. They will automatically attack if you start breaking open facilities with steel doors though. When you find a new facility (or beacon, or drop pod, etc), that has a question-mark, be sure to use the beacon. It will save your progress, and also add the location to your discoveries. Go to your discoveries page and upload it for some money. When landing at bases that have a trading terminal and landing pad, if you land on the pad itself, you can access your ship inventory at the trading terminal. Don't forget to also log every planet and star you visit, for cash as well. Different ships have different performance characteristics and amount of hull damage that they can take, depending on their "class". Science ships (some look like insects) tend to have the weakest hulls, and the bigger "gunship"-like ships are slightly tougher. Fighters tend to be in the middle but also move slightly faster. Also note that the steering is a little more "twitchy" at low speeds on ships that have the cockpit placed further from the center of rotation. Small fighter planes feel a little more "clean" in their steering, as a result. The differences are subtle, and hardly worth mentioning. Storage slots can hold resources, items, technology, or upgrades. The exception is the multi-tool, which can not hold items or resources. Upgrade components are usually worth it, even at only a "+1". I don't have hard numbers to back this up, but I suspect that each +1 is a 100% increase in whatever it is enhancing. Based on in-game experience, each upgrade level seems to have a pretty huge effect. Upgrade components can't be installed with exact duplicates. However, you can install similar ones, and the bonuses stack. That is, if you had a damage modifier of "+3", you could also install a "+2" to get a total of "+5". As to whether it's worth a second storage slot, it will be up to you to prioritize based on what you have, and how you play. Upgrade components that are installed directly adjacent to the thing they're upgrading, or to each other, will add a slight bonus to that upgrade (anecdotally seems to be roughly 5%). These bonuses are cumulative, and therrefore greater when more components are adjacent together. This is a guide to optimizing it, if you're so inclined. Storage slots on your ship can hold 500 of a stackable resource, but the slots in your exosuit can only hold 250. For single, non-stacking items, they're effectively the same. For this reason it's better to store your larger quantities on the ship, and smaller or individual things in your suit. The slots in your multi-tool can only be used for multi-tool tools and upgrades. You can upgrade your exosuit's storage capacity, up to a maximum of 48 slots. You will start with only around 15 slots. The upgrades can be found in two places: Drop Pods on planetary surfaces, and behind the left-side door (looking inward in the landing bay) on space stations, which require an AtlasPass v1 to enter. In both cases, the first upgrade is free, and every subsequent one costs 10,000 units more than the previous one. Ships don't necessarily have to be purchased. You can also find crashed ships, and repair them. They are spawned with +/-1 slots as compared to your current ship, heavily favoring the +1 side. Upgrading this way is going to be just one slot at a time, of course, so if you want subsequent upgrades, you may only want to repair the pulse engine and launch thrusters. You can seek them out directly if you wish. Use the orange beacons with a Bypass Chip, and search for "Transmission" until you get a "Transmission Tower". Use that, and it will give you the location of a crashed ship (a distress call). Theoretically you could keep swapping ships all the way up to a 48-slot ship, without ever leaving your starter planet. Note that it's hardest to do this on Korvax worlds (more observatories than towers), in my opinion. (Note: The glitch that let you use Gek towers repeatedly is fixed). Salvaging crashed ships is a great money-maker too. Particularly the large-capacity ships. If you have salvaged one to keep, you only need to find one or two more crashed ships to get enough of the rare components and resources to repair the one you kept. If you don't need those materials for yourself, you can sell them and make a nice profit. There are many ways to make cash. One of the more lucrative and easy ways to make money is by making and selling Bypass Chips, once you get the recipe. They only take 10 plutonium and 10 iron to make. If you can find a space station that buys them for 100% over galactic average, they will sell for about 7,300 units each (roughly). This is a very tedious and grindy method of making money, though. When you first arrive in a new star system, always check in at the space station, and see what's being bought and sold. You can make a lot of cash if there's a "hot deal" going on (items marked with a gold star are trading at 100% over galactic average). If you can find a star system that is buying the very rare items at inflated prices, and a planet in the same place that has those items, you might want to stay for a while and earn some easy money. Many (not all) of the highly rare items will scan with green icons on the planet surface, such as Sac Venom. The faint lines that stretch out through space between the planets in a star system are trade routes. You will see ships flying along these paths. I haven't explored it yet, but supposedly if you can manage to follow these paths, you can find financially beneficial routes to follow yourself. The "signal scanners" that look like they have a big orange beam shining out of them are useful. With a Bypass Chip (cheap and easy to make, once you find the blueprint), you can select a type of thing to scan for. Scanning for "shelter" will find abandoned outposts (which can give you blueprints, etc), but also Drop Pods that can get you exosuit storage upgrades. Searching for "Colonial Outpost" will get you Operations Centers, and the like, which can also give you some decent technology blueprints. Many of these types of facilities are fairly common and you can find them just by flying around too. When you visit Atlas Interface stations, you will be given an Atlas Stone. As tempting as it is, don't sell them. At least not until you have 10 or more. You will need those for the end-game. It's tempting to sell them, because they're worth a lot, and they eat up valuable storage space. Yes, you will always be out of storage space. It's just simply part of the game, working inside an infuriatingly small amount of storage capacity. If you end up needing to buy Atlas Stones later because you lost or sold one or more of them, be prepared to spend one or two million on each. When visiting the Atlas Interface stations, you can run around the whole interior platform, and many (not all) of the lit up domes will grant you language words. Also, some of the circles on the floor between the landing pad and the atlas console, will give either words or technology blueprints. The Atlas Path is ten steps long, and will feel very anti-climactic (and it will let you continue on toward the center of the galaxy as if you hadn't done it). However, it silently unlocks a new ability that you may find useful. Always try to keep at least one free slot open in your exosuit. Don't hoard things. If you don't have a free slot, you can't even initiate many actions, including talking to aliens, because there's a chance they may give you an item. Inventory management will be an ongoing problem. Be careful when mining asteroids. The mining lasers will auto-target non-hostile ships, even when there is a rock right in front of you. This will turn into a fight, but one in which the other ship sends a distress call, and sentinels will be called in too, unless you can kill the other ship quickly. The basic hyperdrive has a maximum range of "100 lightyears", and the first upgrade item for it that you will unlock ill extend that to "300". However there are three total upgrades available, and installing all three will extend you to "1500". I have these numbers in quotes, because they correspond to a fictitious "linear distance" in the galaxy map, which is inflated by 4x as compared to the distance you need to travel to get to the center of the galaxy. If you warp "1000 lightyears" in free-exploration mode, directly toward the center, you will only make 250 lightyears of progress. As noted previously, black holes allow you to make 2,000 lightyears of progress, and this number actually does correspond to the remaining distance you have to travel. However, you'll notice that the travel distance shown to you afterward is enormous, often in 6-digits. This is because it warps you to a random star at the new distance, so you may be on the other side of the galaxy from where you started. NMS is not a multiplayer game, though your discoveries are shared to the central server, and you wil be shown the names given to discoveries by other players if you run across them. What this means is that if you go to the same place at the same time as another player (such as both landing on the same space station), you will not see each other, and even the times of day on the planets might be different. However, you should see the planets the same way, with the same terrain and distribution of buildings and resources. Two players could conceivably still use this to coordinate, share information, travel together, and "divide and conquer" to quickly recon planets at the same star together. Click here for a complete resource and craftable item list, with where to find them or what crafting ingredients are needed. The "ending" explains very little, as the Atlas Path provides more information directly, and even that is short and cryptic. In either case, after you've reached the end, (*SPOILERS*) this article (*SPOILERS*) explains the meaning of it all. Read it after you've reached the center, or if you don't mind the spoilers.